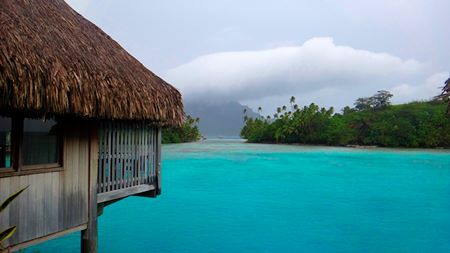 A stay in any of the 86 Hilton Nui Bora Bora overwater villas will be a memorable experience. 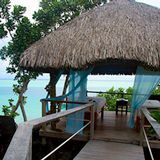 Here's your choice of bungalows and their locations, plus where to find the best snorkeling and Mt Otemanu views. 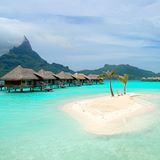 The Hilton Nui Bora Bora overwater villas sit above the deepest blue water of any Bora Bora resort and are all large, with a stylish separate living room, luxurious bathroom and generous deck. 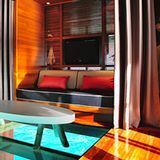 A glass floor panel showcases the amazing lagoon and marine life below and reflects more light into the room to create a lively ambiance. 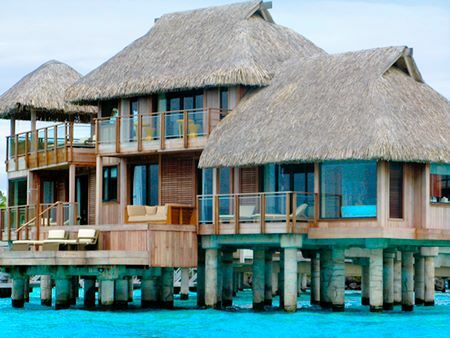 There are 38 Hilton Nui Bora Bora Overwater Villas (95m²/1022sq.ft.) 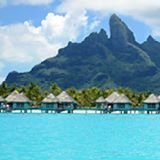 which have lagoon views with other over water villas in sight. 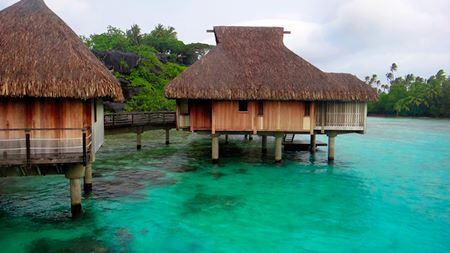 Another 44 Deluxe Overwater Villas (95m²/1022sq.ft.) have views across the Pacific Ocean. The high, woven ceilings and sophisticated 'wood and white' themed interiors of these charming villas provides a romantic escape from everyday life. Walls and furniture feature deep, rich woods. A glass wall has a large sliding door opening to the generous deck where guests can step out to a dining area and padded sun-lounges. The very comfortable, king size canopy bed has a large television screen on the wall in front. You can cuddle up in bed at night and watch a movie with the water lapping underneath. 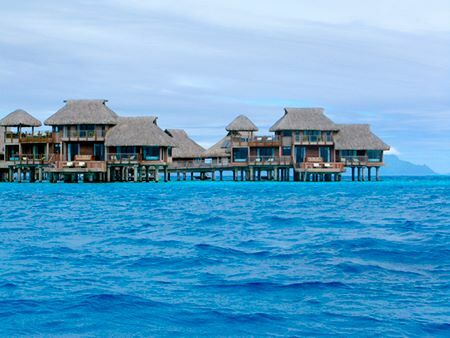 Twin beds are available in some over water villas. Italian marble gleams in the huge, lavish bathrooms. A bath large enough for two is set in an alcove. Both the shower and toilet rooms are also super size. 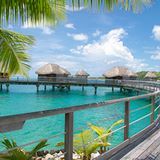 Hilton Nui over water bungalows located further from shore have deeper water under them, so you can have fun jumping from the deck. On some nights you can feel a little movement from the water in those at the end of jetties. Want more space, and privacy? 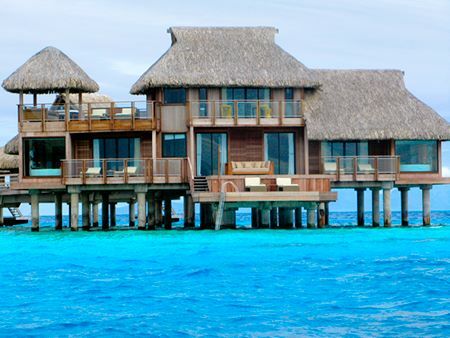 There are two large Royal Overwater Villas (135m²/1453sq.ft.) with superb views, positioned at the end of pontoons (126 & 107). They have Indonesian furnishings and a jacuzzi on the deck. 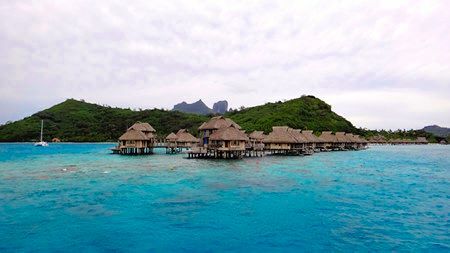 Every lagoon tour-guide points out these two luxurious Hilton Nui Bora Bora Over Water villas (1001 & 1002) which are famous for being the only two-story over water bungalows in Tahiti. These huge Presidential Villas (300m²/3229 sq.ft.) incorporate color in their décor. As they're located at the end of a pontoon they have more privacy and uninterrupted ocean views. 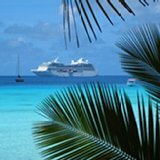 On the lower level they offer 2 bedrooms, 2 dressing rooms, 3 bathrooms and a private sun deck. 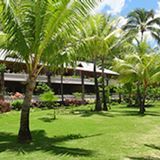 The upper floor has a well-being room with facilities for massage and sauna, plus a large outdoor living area with jacuzzi, sundeck, bar area, deck chairs and dining table. 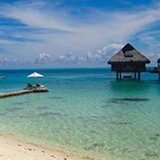 The biggest thrill of having an over water bungalow is that you can step down from your deck to a little pontoon (with shower) just inches above the water to swim and sun in privacy. 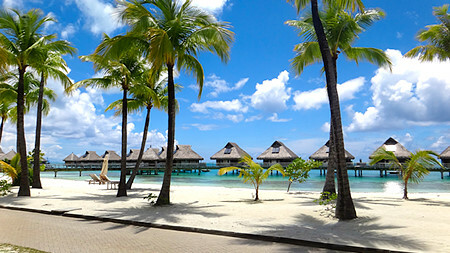 The Hilton Nui Bora Bora over water villas offer something more. 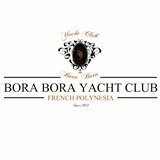 They have the best Bora Bora snorkeling straight from the deck of your over water bungalow! 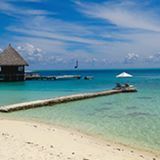 It's extra rewarding snorkeling around the group extending from the right side of the beach, especially those in the 321 to 325 range. There are larger coral heads, for a distance of 20 to 30 meters in this area, attracting more fish. 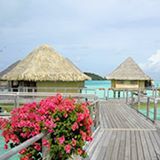 One of the Royal Overwater Villas (107) has the best view of Mt Otemanu, and the neighboring Deluxe Overwater Villas (104,105,106) have similar views. Requests for room numbers are granted, if they are available when you are booking. 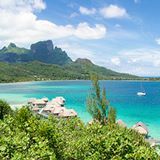 We love the natural serenity of the Nui, but if a great view of Mt Otemanu is a priority, the blissful Hilton Nui Bora Bora over water villas may not be for you.